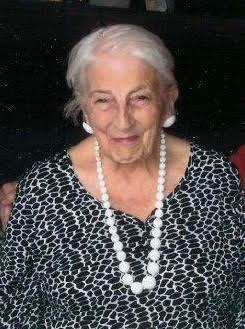 On March 30, 2019, Mary Elizabeth Connelly (nee Marchev) floated away peacefully with family, friends and staff by her side. “Mimi” was 92 years young and since 2011, a beloved resident and character of the Manor and Arbor View in the Willow Valley Community, Lancaster, PA.
Mimi was born on December 24, 1926, in La Grange, IL to Martha Bovier Marchev and Alfred J. Marchev. Since the age of two, she insisted on being called Mimi except with her children who had to call her Mother, a name she treasured most. She is predeceased by her parents and her two brothers George and Alfred. When her father was transferred from Chicago (President of Temple Radio) to Long Island, NY to become President of Republic Aviation Corp., Mimi attended the Convent of the Sacred Heart Maplehurst (‘44) and then received her B.A in English Literature from Manhattanville College (‘48). Later Mimi went on to earn her M.A. in Education from Boston College (‘70). On July 10, 1948, she married John P Connelly Jr of Philadelphia. Jack fell for her desire for a large family and myriad of interests hook line and sinker. They lived a life of corporate nomads as Jack went to work for Cadillac Motor Car Co. his entire career. The job took them from Philadelphia to Detroit, MI to South Orange, NJ to Wellesley, MA to Upper Saddle River, NJ to Weston, MA and finally back to the home office in Detroit, residing in Birmingham, MI. Jack predeceased Mimi in February 2005. Mimi leaves behind her seven children and their families: John P Connelly III (Patty Gladwell), Christopher Connelly (Mary Connelly), Stephen Connelly (Katja Wiemer), Martha Leitner (Paul Leitner), Matthew Connelly, Benjamin Connelly (Tracy Connelly) and Connie O’Brien (David O’Brien); eight grandchildren: John P Connelly IV (Tonya Connelly), Vanessa Connelly Thoens (Kurt Thoens), Marian Leitner-Waldman (David Waldman), Elizabeth Leitner, Aileen Leitner, Emma Connelly, Alex Connelly and David C O’Brien Jr. In addition, Mimi leaves behind two great-grandchildren: Molly and Lilly Connelly. She was blessed with scores of cousins, nieces and nephews around the world. She made great friends at Willow Valley and leaves a big hole in their karaoke community. Her days were spent reading but most of all writing and exploring on her computer. Her love of genealogy and helping others with their family history was well known as was her membership in the Pennsylvania Chapter of the Mayflower Society. To say Mimi was curious is an understatement. She wondered about every phase of life. And most of all, she loved God and kept in touch with Him every day of her life. A gift she shared with so many who knew her through her prayer line. In her inimitable way, Mimi has donated her body to science. A memorial mass will be held in her honor at a date and time to be determined. In lieu of flowers, donations can be made in her memory to the Discalced Carmelite Nuns Boston Carmel at 61 Mount Pleasant Avenue, Roxbury, MA 02119 or to St Joseph’s Abbey, donations accepted online at (www.spencerabbey.org/support-the-abbey/).